English as a second language (ESL) has been established since the 15th Century. This bilingual program contributed to strengthening ties and the development of trade. Now, with the onset of technology, we no longer need physical classrooms as virtual classrooms allows each and every one of us access to online lessons at the very comforts of our home. If you are looking forward to learn or teach English, good news as 51Talk is now in the Philippines. 51 Talk is a premier online school in Chinese and it has now marked its expansion in the Philippines. Filipinos are known to be the best, most knowledgeable and proficient in English so its the best scene to establish an upgrade in the ESL scene. The name 51Talk is actually derived from "I want to TALK". The name itself depicts the goal of the company which is to offer optimal talk time for its students to learn any language. So aspiring English teachers, check out 51talk.com/ph as they are offer both part-time and full-time employment. 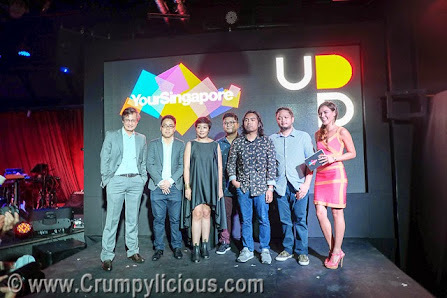 It's been almost 4 years since I've seen Up Dharma Down perform so I was ecstatic to be invited to their Your Singapore Launch at 12 Monkeys. As Singapore celebrates its 50th year of independence, it acknowledges many things that contributed to their nation's fast development. One of those is the tourism industry. Since the 90's Filipinos have loved visiting Singapore. Thus, it has collaborated with Up Dharma Down with their new Single "All the Good Things". The song is about putting idea into action by doing it. Travelling is one of the many ideas many of us conjure but don't really do. So, in their video, they captured popular destinations in Singapore which they loved like Gardens by the Bay. The music video is directed by John Polhem, former creative director at MTV Australia and a Gold Awardee for Music Video at the New York Film Festival. Through their music, Up Dharma Down inspires us to go and travel and experience new things especially with its Golden Jubillee deals featuring a selection of flight and hotel promotions. Fly on special airfare deals, get a 3rd night accommodation free for every 2-night stay, and enjoy the Singapore Sale even more with a chance to win S$500 daily. View Up Dharma Down’s video at www.yoursingapore.ph. For more information about the Golden Jubilee deals, visit www.yoursingapore.com/goldenjubilee. It is quite a shame to notice the fact that online games have a pretty bad reputation at the moment. That is especially the case when referring to multiplayer online games as they are much more addictive and they can easily bring in various negative aspects that you do need to always take into account before you decide whether or not you should play such a game. Everything is so much more complicated than with simple options like this online drawing site but there are still many advantages that you have to consider. Such games will allow the player to build a network of friends. Interaction is always promoted as there is a need to support each other in order to actually win the game. Teamwork is highly important and you can so easily learn how to become a part of a group of people that have the same goal. You will notice that your self-confidence will be boosted through such games. It is 100% true that many of these games rely on teamwork but there are also solo player modes that you will get better at as time passes. As you improve your game, you will be able to increase your belief in yourself. Many will tell you that online games hurt your social interactions but that is not actually the case. If you do interact properly with other players, you can actually boost your overall social interaction, which is a huge advantage of playing online multiplayer games. Multiplayer games are designed to last a really long time. When you play with many friends, the time that you spend inside the game is even longer. That is something that you have to calculate. This is something that many do not realize until it is too late. Unfortunately, because of the fact that you play for many hours at a time, you can be faced with health problems like carpel tunnel syndrome or eye problems. Posture problems are usually common and so many can be faced with severe stress on nerves and joints. It is important that you use due diligence and that you try to exercise as much as you can on a daily basis. That is something that will aid you a lot since you can reduce the health problems that appear. Last week, every one has gathered to see LG Electronics largest and newest model. This model was globally launched in Las Vegas early this year. And, now the 105UC9 is the Philippines. The model 105UC9 boasts of a resolution of over 11 million pixels (5120 x 2160). It is 5 times more than on a Full HD TV. It also has a CinemaScope 21:9 aspect ratio. You can expect ultra-sharp, vivid and lively images boosted and amazing surround sound with its built-in 7.2-channel and 150W sound system that will transform your home into a movie theater. The superior picture quality of the 105UC9 is complemented by LG’s True 5K Engine Pro and IPS 5K Panel. The former eliminates visual errors and can upscale lower-resolution content into near-ULTRA HD quality, while the latter provides consistent contrast, true-to-life colors and a wide viewing angle. By combining Film Patterned Retarder (FPR) 3D technology with extremely high picture resolution, LG’s 5K 3D+ feature offers unobtrusive and compelling 3D viewing pleasure. And, it's 5K 3D Upscaler converts content in SD, HD and Full HD is into crystal-clear, near-ULTRA HD resolution. The 105UC9 brings users a wholesome experience with its LG Smart+ TV with an intuitive WebOS platform. LG's WebOS allows users to switch between shows, discover new shops and connect through other medias and devices. If you have elderly relatives, you've probably been acquainted with Polident. I'm betting you know someone with dentures because the Philippines has the highest number of denture wearers in Asia. Did you know that there are over 9 million Filipinos wear dentures? And, according to the qualitative research titled "The Emerging Consumer Denture Journey", majority of denture wearers are between 35-69 years old. 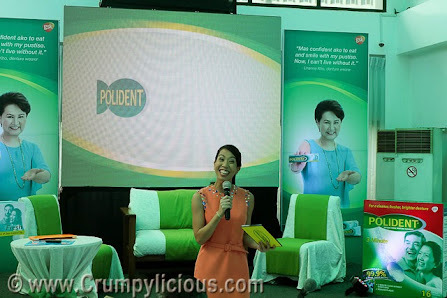 To educate the public, GlaxoSmithKline (GSK), in collaboration with the Philippine Prosthodontic Society (PPS) embarks on new campaign "Take the Polident Challenge". Polident denture care products include Polident Denture Cleanser which is formulated to clean dentures, remove stains and kill 99.99 percent of odor-causing particles. I think this is the more popular product because I've seen this. But, there's also the Polident Denture Adhesive Cream which helps secure dentures properly for up to 12 hours, and seals off gaps to stop food particles from entering the dentures. Knowing proper denture care will make its users more confident without any fear or embarrassment of them having to fall off. 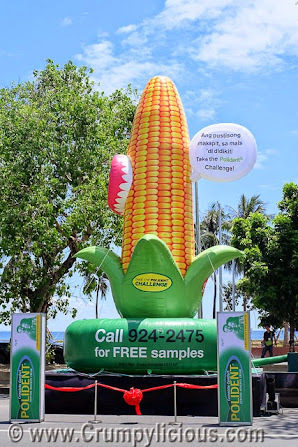 The campaign will have a series of educational activities in Metro Manila such as free denture consultations and fun denture torture tests like corn-eating contests and videoke contests. If you see this big corn cob balloon, then there's a challenge near you. For free samples and delivery nationwide of both Polident Denture Cleanser and Polident Denture Adhesive Cream, call 924-2475. Last Saturday, Asus finally officially launched the ZenFone 2 in the Philippines during the Experience 2Morrow event. I know many of you have been waiting for this moment. I've been waiting for this since last year! If you are still thinking whether or not you should buy this phone. Let me share with you the Top 15 Reasons To Buy the Asus ZenFone 2 from what I’ve gathered from the phone specification and actual demo Asus ZenFone 2.
award in industrial design). It is made of high quality polycarbonate plastic with metallic hairline finish and concentric-circle detailing. The ergonomic arc design makes it easy to hold even with one hand. The volume buttons at the back can easily be pressed by the index finger. It has a 3.9mm ultra thin edge. The ZenFone 2 comes in various colors and designs: 5 Classic Colors - Glacier Grey, Osmium Black, Glamour Red, Ceramic White, Sheer Gold, 4 Illusion designs and 3 Fusion designs. Dimensions are 152.5 x 77.2 x 3.9mm-10.9mm. It weighs 170 grams. In addition to your internal memory 16GB to 64GB (depending on your model), you can expand your memory externally via Micro SD Card. It is equipped with “SonicMaster Audio with ICEpower Technology” that delivers crystal-clear surround sound and extends to one octave lower. The ZenFone 2 has a sound chamber that is 25% larger than the 1st generation. It also has a smart software called “AudioWizard” which offers different scenarios: Movie Mode (strength bass, optimize vocals), Gaming Mode, Keynote Mode, Music Mode (strengthen vocals and optimize bass) and Smart Mode. It also has a dual microphone (top and bottom) and professional processing for clearer voice and noise cancellation. The touch sensor has a record-breaking response time of just 60 millisecond. In addition, it supports glove touch. The ZenFone 2 has a 72% screen to body ratio with borderless design. This beats the Iphone6 with only 63.8% viewing display. It has 5.5 inch screen same as the Iphone 6. The Asus TruVividTechnology combines the GFF full lamination - allows it to be thinner than the conventional G/G air bonding since it does not have any airgap and at the same time it has a better transparency level of 94% and super anti-scratch Corning® Gorilla® Glass 3 with Native Damage Resistance (NDR). NTSC color range and LTPS technology. Display setting allows adjustment for color temperature, hue and brightness. In addition to the customized screen color mode, there are default one such as balance, reading and vivid. It also has a Bluelight Filter Mode which eliminates 30% of the bluray in order to ease your eyes. The ZenFone 2 supports 802.11ac Wi-Fi Direct up to 433 Mbps, Bluetooth 4.0 and even NFC. It’s equipped with the fastest 4G or LTE-A 250 Mbps with Carrier aggregation. The ZenLink allows you to connect with any ZenFone 2. Now, you can protect your privacy with the Snap View Mode. There’s also a Kids Mode. The ZenMotion with Touch Gesture allows you to set up 6 motion gestures. You can also double tap to wake it up or go to the One Hand Mode. With the BoostMaster Technology, you can charge 60% in more than 39 minutes. It promises 4 hours of 2G talk time and 2.7 hours of 3G talk time. It also has multiple smart saving modes. It is also powerful in terms of performance but saves more energy with the Intel exclusive 3D Tri-Gate Transistor. The ZenFone 2 has a Quad-core 64-bit Intel® Atom™ Z3580/Z3580 Processor (1.8ghz/2.3 ghz), 2 GB/4 GB dual-channel DDR3 RAM and PowerVR 6430 533 MHz GPU with OpenGL3.2. There are 3 models to choose from depending on your budget and needs. The 13 MP PixelMaster Camera 2.0 (and 5 MP front Camera 2.0) is one of this phone’s main selling point. The camera has is a 5 Element Lens Manufactured by Largan Precision. Its features include: f/ 2.0 Super Large aperture for low light, 85 degrees wide-angle lens for selfie (with beautification mode), PixelMaster Backlight (HDR) mode (takes different exposure with ASUS Pixel Enhancing Technology), dual LED real tone flash, 140-degree panoramic selfie and super resolution mode which processes the imagine 4x (so that’s 13 MP x 4 = 52 MP Resolution). One of the best camera feature is the full manual mode which allows you to tweak the horizon levels, histogram chart, emotional zoom bar, shutter speed, white balance control, ISO control, EV control, focus distance, saturation, sharpness control, metering mode and separate AF/AE points (like a DSLR). Accessories like the Asus View Flip Cover Deluxe (995 php), ZenFlash (995 php) (100x Brighter than LED flash), LolliFlash (495 php), and ZenPower (795 php) (credit card sized 10,050 mAh powerbank) are available at affordable price. In fact, if you bought your phone during the launch, you’d get them all for FREE. The biggest factor in considering buying a ZenFone 2 is its PRICE mark! For only 9,995 php to 14, 995 php, this is surely one of the bang for the buck phones to come out yet. BONUS: Since it's officially launched in the Philippines, you can now enjoy this unit with warranty yey! No matter where you want to go for your overseas wedding, transporting the wedding dress is something that you want to know how to do. Destination weddings are constantly growing in popularity and if you do travel over a really long distance, you will want to be sure that your dress will get there safely. You can see that 10awesome.com has this article on cheap wedding gown ideas but even with the cheap ones, you want to have it at home and at the wedding destination. This is the first question you will want to ask yourself. Talk with the carrier to see if your travel insurance policy covers the gown and then see if you can put the dress in your luggage with ease, without ruining it. Most of the airlines will tell you if there are special allowances that are available for wedding dresses. In most cases there are no special allowances that are available but you may find something interesting that you can take advantage of. In the event that you will pack the wedding dress in a bag, make sure you take a travel steamer with you. As you get to the hotel room, hang the dress in the bathroom as soon as possible and turn the shower on with water that is very hut. Steam naturally eases wrinkles. If you are afraid that your wedding dress will not be in a great condition in the luggage or when you carry it on the plane with a bag, you can actually buy a new plane ticket for the wedding dress alone. This is definitely something that will be really weird for a lot of people but it is one action that you will need to consider and that can help you out a lot in making sure that the dress will be in a perfect condition. All of the airlines will agree to offer more tickets so it should not be a problem to buy a ticket only for your wedding dress. However, you still need to pack it properly as you do not want it to get dirty during the transportation. Make sure that you pack your dress and you then take care of it before the trip, during the trip and after the trip. You will surely appreciate it when your dress is perfect on your wedding day. When you're out of a job or need something that pays more money, a driver job list might be the answer if you have the proper license. This is a list that features several jobs that are available across the country for drivers of trucks. There are also jobs for delivery drivers for small companies, but most of them are for large trucks that travel from city to city or even from one state to another. There are benefits to lists that have driver jobs. As a driver, you might not have the time to look in the paper for something new or online for a new job. Access to a list of jobs in one place makes it easier to compare the pay for each job as well as the location for the job. Details about who to contact and when the job was posted are available as well. A list gives you a chance to sort jobs based on where they are located so that you can only apply to those in your area instead of wasting your time applying to jobs that are in another state. You have the option to click here on each job and apply online once you find something you like.